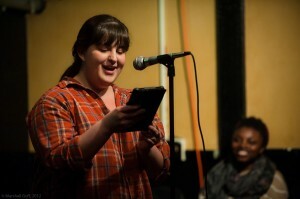 Emily Carroll reads at the Boston Poetry Slam at the Cantab Lounge. Photo by Marshall Goff. Already an avid poetry slam listener when she moved to Boston in 2008, Emily Carroll spent a couple of mostly silent years soaking up the voice of the Boston Poetry Slam before she came to the mic. 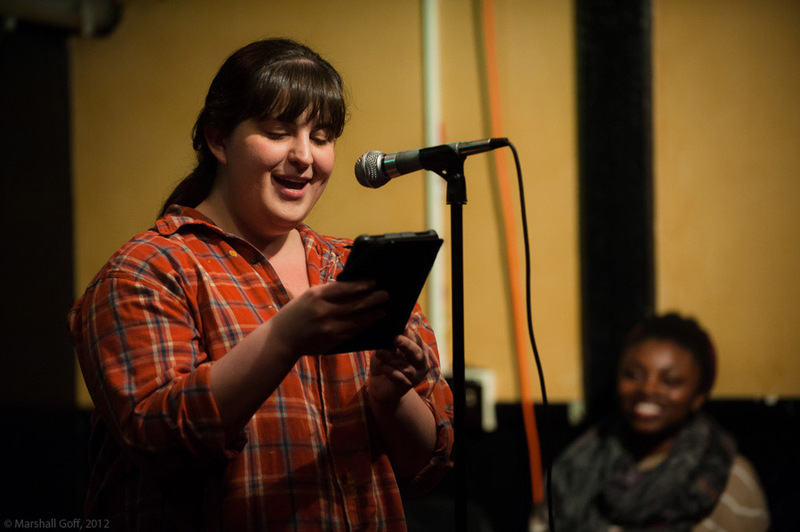 A regular reader, National Poetry Slam volunteer, fill-in bar server, and three-year co-curator of Moonlighting, the Boston Poetry Slam’s now-retired queer open mic and reading series, Emily still can’t get enough of the Boston Poetry Slam. Emily holds a BFA in Writing, Literature, & Publishing from Emerson College, where she was co-curator and SlamMaster for the Emerson Poetry Project. She is now a freelance writer, editor, designer, teaching artist, and waitress. She lives in Jamaica Plain with her partner and PJ, the wonder pug of Forest Hills. You can email her at emilyhcarroll@gmail.com.